One of the largest budget strains in the summer months are the higher utility costs due to extra electricity needed to run air conditioning and extra water for pools, sprinklers and the like. While it is important to stay comfortable during the hottest months of the year, it can also do devastating damage to your budget and savings if you are not careful. 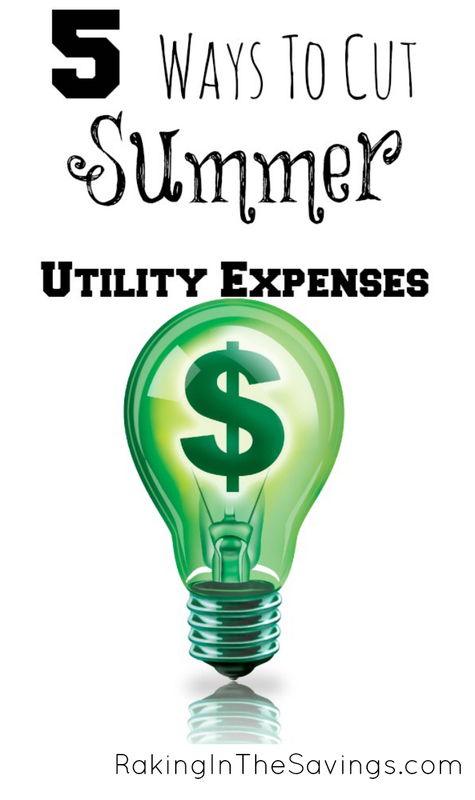 Here are 5 Ways To Cut Summer Utility Expenses that are simple, cost effective and worthwhile. It is often the smallest of changes that make the largest impact on your budget. Check out these tips and apply them to your home this year to see a marked difference in your summer utility bills. Shut the doors & window dressings: As much as we love the sunshine pouring into our homes during summer months, the rays on our windows and doors can also increase the temperature inside your home. Keep your doors and window blinds or curtains shut to help keep the inside temperature steady. Head to the lake or community pool: Rather than run water for sprinklers or pools at home grab the kids and head to the local lake or community pool. Take advantage of the free cooling water rather than paying for the privilege at home. Tint your windows: While this is an up front expense, it can be worth it to invest. Especially if you have little to no shade covering your house during the sunny days of summer. Look into professional window frosting or tinting or grab a few kits like these found on Amazon and do the job yourself. Make sure to invest in a tint that blocks the UV/IR for ultimate protection. Hang your clothes out to dry: A $1 length of rope and $1 package of clothes pins can literally save you hundreds of dollars in the long run. Run a clothes line outside and start saving by allowing your clothes to air dry rather than running your dryer. If you have limited outdoor space, you could also use an umbrella clothesline or a retractable clothesline. Don’t use your oven: While baked goods are always a welcome treat, the summer months are a great time to eliminate them from your diet. Using the oven will only bring the temperature in your kitchen up causing your air conditioning to run extra to keep up. Take to the grill, avoid the baked goods, or use things like countertop bread makers instead. No matter which of these 5 ways to cut summer utility costs you use this year the benefits will be visible on your bills each month. Remembering to be aware of little things like leaving doors open, cutting off water while you brush your teeth or making sure to only run your dishwasher when it is full instead of for just a few dishes at a time. Every little bit helps when it comes to utility costs. Previous article: Dial Foaming Hand Soaps Only $1! Next article: Yoke’s Coupon Deals 5/28-6/3! Grape Tomatoes, Fryer Hindquarters and More!